Long before you spin a single song, the very name of it – Meet Me at Minton’s – conjures the spirit of the long, long sleep of ‘kings’: Teddy Hill, Charlie Parker and Dizzy Gillespie, Thelonious Monk and Bud Powell, Kenny Clarke, Charlie Christian, Joe Guy and Nick Fenton. 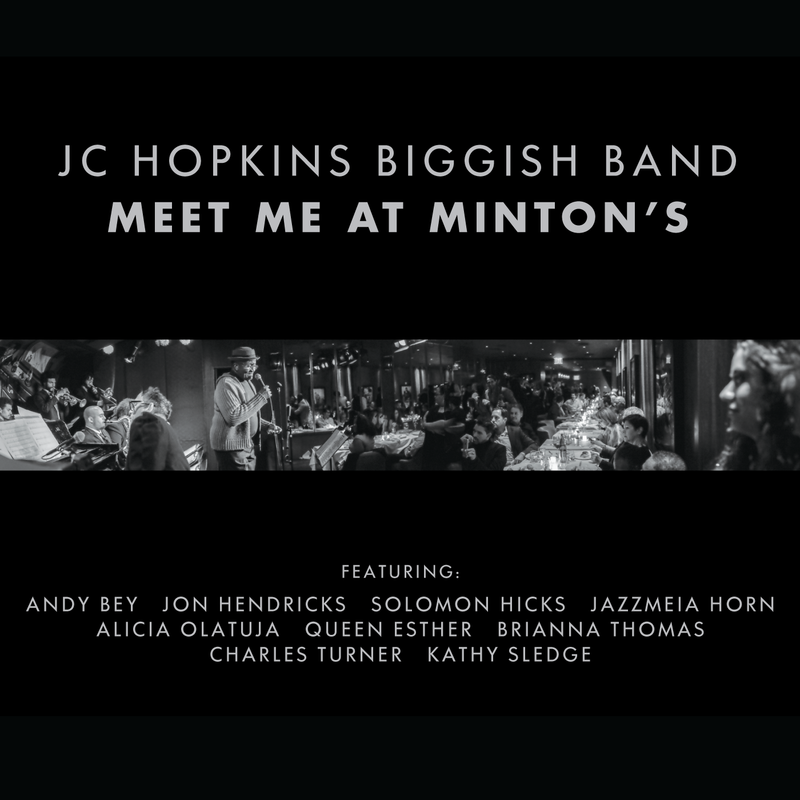 Then comes the first song by the JC Hopkins Biggish Band, “Remember When” – an original by pianist JC Hopkins, no less – and we are instantly transported to the iconic low-lit jazz club. It’s not a sentimental journey, but one filled with vim and verve; even the kind of legendary joie de vivre that once brought Harlem brought to its feet. We are not simply transported to a time that once was again, but it feels good to be alive in a strange, spine-tingling sort of way and it’s the music – only the music – that makes us feel this way. The JC Hopkins Biggish Band has four very crucial things going for it. The first is that it seems to have absorbed, completely, the music and the atmosphere – indeed the very ethos of the Jazz Age that seemed to come alive at a time when the Age itself was in its waning years. But we are in the present, perhaps even in the future, from where we are looking back and here we encounter the second remarkable aspect of this band and this music: all of its players are young, vivacious – the new generation of Jazzers – who will carry the torch into the next age. Thirdly, these musicians are willing and eager participants in the continuum of its (Jazz’s) history. And four – perhaps most interestingly – five of the thirteen tunes are written by its bandleader JC Hopkins. Although we don’t really need it, the music is alive and well and living outside Dizzy’s, the Vanguard and the Lincoln Center too. The energy of this 17-piece JC Hopkins Biggish Band is impressive, not to mention palpable, and its featured soloists are even more so. “Remember When” sweeps in with visceral energy and while the unison performance is inspiring, the glue that holds it all together is the monumental vocals of Brianna Thomas, a young vocalist with the heart and soul of a later-day Sarah Vaughan. Jon Hendricks’ performances on the Thelonious Monk tunes: “In Walked Bud” and “Ask Me Now” are as iconic as they could ever be. On the latter tune, generations melt away as the ever-wonderful Jazzmeia Horn and Mr Hendricks play lovers to the hilt. The woefully under-appreciated Andy Bey is no less wonderful on the other Thelonious Monk tune, “Reflections”, a work filled with irony, charm and bittersweet beauty all rolled in one. Some of the most memorable moments come by way of the music written by JC Hopkins. The ‘queens of soul’: Brianna Thomas, Jazzmeia Horn, Alicia Olatuja and Queen Esther herself reign supreme on the five songs. The energy of the band that plays behind the vocalists is most affecting. I would be remiss if I did not mention Charles Turner’s star turn on “Meet Me at Minton’s” and “Spreadin’ Rhythm Around”, or Kevin Burke and Aria Hendricks of Jon Hendricks & Co, or Kathy Sledge and the grand manner in which she brings proceedings to a close with “All of Me”; not before each member of this well-oiled machine draws just the right amount of spotlight to himself; enough, that is, to ensure that the whole is greater than the sum of its parts.